In the wake of the Paris attack, the world is reminded of the strong republican self-image that has been central to the course of modern French politics. 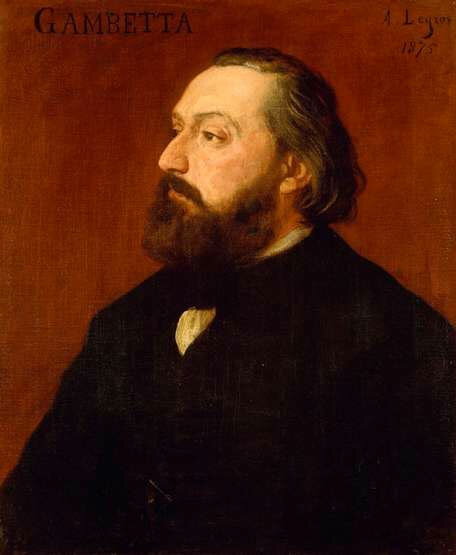 Léon Gambetta, leader of the Government of National Defence during the Franco-Prussian War. By Alphonse Legros (1875). Confronting a traumatised nation in the wake of the recent terrorist attacks that left more than a hundred people dead in Paris, President François Hollande did not hesitate when it came to the meaning and import of this barbaric act. These were attacks 'against France, against the values that we defend everywhere in the world, against what we are: a free country that means something to the whole planet'. This pronouncement was followed by displays of national mourning in the capital and international expressions of compassion and moral support. Leaders from the United States to Iran condemned the act as an attack on humanity and civilisation. Social media remains flooded with declarations of 'Je Suis Paris' while buildings around the world stand illuminated in the colors of the French Tricolor in shows of solidarity. The current attacks on the French Republic has been widely interpreted as an attack on the values of democracy and civility held dear by all, a message that has been strongly underscored in many of Hollande’s addresses since the attentat perpetrated against the satirical newspaper Charlie Hebdo last January. While France grapples with the new realities and security concerns raised by a global war on terror, Hollande’s declarations harken back to a well-established republican tradition in the country. For over two centuries, French republicanism has persistently expressed many of its core values through an awareness of la patrie en danger. The First Republic founded during the French Revolution was shaped in the crucible of European war and threats of foreign royalist conspiracies. During the Revolution, the defence of the republic became intimately bound with the patriotic duties required of all newly minted French citizens. Revolutionaries drew their inspiration from Rousseau, who contended that military virtue was essential for the security of any republican society. In shaping their brand of militant patriotism, radical republicans could easily equate the virtuous citizen with the virtuous defence of the homeland. National security was a preoccupation of France’s earliest republicans, who were inclined to go to extreme lengths if necessary to defend the values of a free and democratic people. As Robespierre reminded his followers, to 'good citizens' the republic owed 'the full protection of the state', while to 'the enemies of the people it owes only death'. From Rousseau to Robespierre, the republic was envisioned as perpetually embattled, necessitating armed resistance and struggle if its desires for freedom over oppression, barbarism and tyranny were to be realised. A century later, the Third French Republic was born from a similar sentiment of la patrie en danger. Taking power in the midst of the Franco-Prussia War, republicans found themselves faced with the dual task of founding a government and defending the country from German invasion. Léon Gambetta’s Government of National Defence made frequent allusions to its revolutionary predecessor, hoping to repeat the successes of the revolutionary people’s army and rally citizens to a vigorous defense of the nation. The failure of the French military in 1871 did nothing to sever the strong link between French republicanism and national defence. On the contrary, this corollary constituted part of an evolving republican tradition. The persistence of existential threats to the nation became a hallmark of republican ideology and rhetoric, urging national unity and solidarity in the face of foreign enemies. Although socialists and a pacifist left actively opposed new laws dictating longer terms of military service on the eve of the First World War, when hostilities finally arose they ineluctably showed their republican stripes. During the war the left put aside its ideological squabbles and joined in l’union sacrée. Partisans in time of peace, they were committed to the collective defense of the French Republic and its values in moments of war and foreign invasion. A similar rhetoric threaded itself through the domestic contentions of the Boulanger and Dreyfus affairs of the late-19th century, in which anti-democratic elements within the French clergy and military conspired to bring down the republican regime. As the forces of antisemitism, militarism and authoritarianism coalesced to challenge republican institutions in the country, 'the republic in danger' became a widespread sentiment among its supporters, prompting the moral defence of equality and the universal values that the French republic embodied. These divisions later mutated into the fierce ideological struggles between left and right in the interwar years, in which defenders of the beleaguered republican ideal identified themselves with the defence of the nation and, by proxy, the values of humanity against the illiberal tide of fascism. The threat to republican institutions and values has elicited perennially an emotional response among a politically charged and ideologically motivated French citizenry. In a more particular manner, it has been typically in times of extreme crisis that the French republic has identified itself most closely with a set of universal values that transcend the French nation. In 1792, as Austro-Prussian forces pushed their way toward the French border, republicans made grand declarations insisting that the principles of the French Revolution were not only intended for the French but for all humanity. These calls to ideological solidarity with the people of Europe were aimed at rallying supporters abroad and inspiring similar uprisings in the capitals of France’s enemies. The defence of the republic encouraged the universalisation of its principles, transforming a national revolution into the defence of international freedom and humanitarian aspirations. This self-fashioning invested the Revolution with what historian Suzanne Desan has aptly described as 'the emotional power of global fraternity'. Throughout the 19th and 20th centuries, politicians and ideologues never abandoned a certain idea of the republic as a repository of common human values nor desisted in the belief that 'in France the destiny of mankind is expressed', as the republican lawyer Hippolyte Marlet once remarked. In recent years claims of French universalism have been greeted with a considerable deal of scepticism. There has been no scarcity of critics ready to diagnose the 'crisis' of French universalism as globalisation, immigration trends and growing demands for multiculturalism pose challenges to a specific idea of French tradition and national identity. In particular, France’s perceived inability to assimilate a Muslim minority into its society (whether accurate or not) has assumed centre stage in this crisis. Yet the current rhetoric coming from the Élysée Palace has struck a very different note, one that has resonated internationally. Following the attack on the offices of Charlie Hebdo earlier this year, Hollande spoke to the world and revived a cherished republican tradition. 'France was attacked in what it holds most sacred', he informed his audience: 'freedom of expression, the republic and human equality.' The attack on a satirical newspaper was quickly interpreted as an attack on common values of free expression and liberty, provoking an international outpouring of sympathy and support for a grieving nation. In the wake of the January violence, the French Republic and the values it claims to embody have acquired an international salience, reviving an historic association that has characteristically linked a beleaguered republic with the cause of humanity. In the wake of yet another horrific incident, the world is reminded of the strong republican self-image that has been central to the course of modern French politics. 'La république est en danger' is representative of a still greater danger, one 'threatening the whole world', as Hollande had intimated. If French universalism had been called into question in recent years, terrorist violence in the heart of the French capital has served to rekindle the relationship between the republic and the cause of humanity. As people around the world take up the chant of 'Je Suis Charlie' to express support for freedom of expression or tweet messages with hashtags urging 'Pray for Paris', France has once again become the symbol of universal values that are, at present, under threat.